David Brooks, the New York Times’s resident neoconservative, delights in peddling a false alternative: freedom or social order. His latest column hawking this snake oil comes in the form of advice to the struggling Republican Party: “If the Republicans are going to rebound, they will have to reestablish themselves as the party of civic order.” In other words, give up freedom. I have no wish to defend the Republicans. Heaven knows there’s nothing left to defend. In a mere eight years that party embroiled the United States in two murderous invasion-occupations, ushered in a dramatic decline in civil liberty, spat on the decency of Americans by authorizing and applauding torture, bailed out big banks, and spent the country into mind-numbing debt. But according to Brooks, the Republicans’ problem is that all they care about is freedom! “Republicans are so much the party of individualism and freedom these days that they are no longer the party of community and order,” he writes. Is he kidding? Republicans certainly talk about freedom. They just they never get around to actually respecting it. Small-government rhetoric is like a costume they don when they need votes or money. But back to Brooks’s false dichotomy. To create it he has to invent a straw man. He pits “untrammeled freedom and the lone pioneer” against social customs, community, and order. The flaw in Brooks’s argument is that history’s most authentic advocates of individual liberty (they weren’t Republicans) saw harmony, not conflict, between freedom and community. Freedom, they realized, blossomed within a community, not just because of the benefits bestowed by the division of labor (as important as they are), but because of the rewards of deep human contact. Man’s nature as a social animal is not an argument against liberty. Quite the contrary. Liberty, Proudhon said, is the mother, not the daughter, of order. What real individualists oppose — is coercive community. Here’s where Brooks shows either his ignorance or his disingenuousness. I defy him to name an individualist philosopher who extolled the life of the hermit. By nature individuals form communities. They don’t need to be coerced. The bedrock laws most people respect — those concerning life, liberty, and property — began as spontaneously evolving reciprocal social customs born of people’s desire to engage in material and “spiritual” exchanges with one another. Brooks complains that those who place great value on the market order, “which is a means, ... are inarticulate about the good life, which is the end.” The great individualist philosophers were never inarticulate, but they understood, as Brooks does not, that what constitutes the good life is none of the government’s damn business. What rational person would want George W. Bush or Barack Obama or John Boehner or Barney Frank to have any say in the matter? Has he no clue that every problem he names has it origins in government interference with freedom, voluntary community, and the market order? Contrary to Brooks, the problem with Republicans is not their (empty) expressions of individualism. Rather, it’s their hypocritical refusal to take their own words seriously. In 1960 it was one man, one job, one family, over 4 kids and compulsory wife and mother. Now its two parents, two jobs, 2 kids and other families/partners optional. The big difference is that equal opportunity and pay had the effect of making two jobs a necessity for the average family as the state could spend vastly more on social spending, allow plenty of inflation that eroded the value of just one wage packet and allow the concept of the nuclear family to erode. Somewhere between 1960 and today we allowed the equilibrium between the nuclear family and fairness to women to be lost, to the point where two wage packets are needed to support a national structure where 50% of the population are net beneficiaries of the state. It seems to me that what was initially a fair recognition of women in the workplace has morphed into women becoming an economic necessity first with family in the rear. Of course there are lot's of other influencing factors like increased consumerism, increased ability to control fertility, and greater (often unrealistic) demand for personal happiness but, well-said JC. I am sorry I don't know who you are and probably should. You have provided a valuable overview. "I have a problem but it's not my fault"
She questioned where responsibility for nutrition, physical activity and obesity fell if not with DHBs. "It's too big for the individual person to cope with. You need a supportive environment." There it is in plain language. The individual is powerless and weak. Now it is true that some of the individuals I have come across are weak and powerless but they have been made that way by the thinking and practices that surround them. Their lives lurch from one crisis to another against a backdrop of self pity and external indulgence. People like Sturgiss feed their self-justification for failure, "I have a problem but it's not my fault." The nutrition, physical activity and obesity target for DHBs had included goals for increasing the proportion of people who ate their recommended servings of fruit and vegetables. "How can you hold a DHB accountable for that?" A big tick for Mr Ryall on this one. I must say watching the anti-obesity campaigners put firmly on the back foot by National has been quite satisfying. Gang members facing fines for wearing patches in Wanganui's Victoria Avenue are taking legal action to stop Work and Income from making deductions from their benefits. They have also lodged a complaint with the Human Rights Commission, claiming the ban on their patches and associated insignia unfairly punishes Wanganui members and their partners and children. "No-one's paid a fine and no-one's going to," an affected member told The Wanganui Times yesterday. "The police can't do this. They can't take our patches when we haven't done anything wrong. These patches belong to us." The members taking the action, who are understood to be on benefits and may qualify for legal aid, have hired a lawyer to gain an injunction and fight the ban. Two weeks ago members filed their complaint with the Human Rights Commission. Though the fines were due for payment this month none were willing to pay, the affected member said. One partner claimed her nine-year-old son had watched in tears as his father was arrested on Victoria Avenue last week. Three gang members arrested in the confrontation appeared in Wanganui District Court yesterday on joint display of insignia charges. Wanganui Council's tough new national policy, designed to sidestep the Bill of Rights, follows a two-year legal battle to get gang insignia banned. Gang members have been angry about losing their patches to police but say they are easy enough to replace. "It's a waste of their time and our money, oops, sorry, that's your money, aye?" a laughing member told the Times. So we can't stop gangs and their women from bludging off us wholesale BUT we can take away their patches. Yes. Just confirmed in parliament, ACT (or at least ACT's leader who took the call) is going to vote for the Gang Insignia Bill because patches constitute intimidation; because David Garrett has gone to Wanganui and talked to the police and the gangs, and the police have promised to enforce the ban and the gangs have said they will stop wearing their patches. No. This isn't a piss take. Hide said in his speech that the passage of the bill relied on his vote. It didn't. Perhaps he miscalculated. Perhaps he saw an opportunity to buy the popular vote. It is the first time we have seen ACT's split vote facility in action. It won't be the last. The split vote is a sop to members. It'll allow ACT to support National in the passage of authoritarian and conservative legislation, while continuing to claim their liberal principles to members. It is a cynical manipulation of supporters. I agree entirely with Blair Mulholland about what ACT's role should be. Backers of the law claim that it’s necessary to crack down on gang members and that they need to be cracked down on because they’re always breaking stuff and hurting people. If that was true you wouldn’t need a law against leather jackets, you could just arrest all these gangsters under the Prohibition of Breaking Stuff (and Hurting People) Act. The women (attached to gang members) that Housing New Zealand are attempting to evict from a Taita street are taking legal action. We ain't going anywhere, they say. They are apparently all on benefits so will qualify for legal aid. A certificate from Work and Income showing their gross income is less than $20,000 will take care of that. Although legal aid is supposed to be a loan it will likely be written off in this case. There is no owned property to make a charge against. So the taxpayer is funding these women's benefits and their accommodation, both of which have been abused. They get away with the first abuse because of a legal ruling which defines their relationships as 'not in the nature of marriage'. Then, when they decide to fight the consequences of the secondary property abuse, the taxpayer has to foot their legal fees. Just how far removed is all of this from a 'safety' net? "I'm concerned about the effect on the women and children. Housing NZ have really really rushed this." What a first-class apologist for manipulators this man is. These tenants and their partners have society over a barrel. They are not victims and they are not clueless. Children are hostages to and guarantors of their chosen lifestyles. It's a pig of a mess made worse by weak leaders like Horomia. Analysis of divorce statistics by year of marriage shows that about one-third of New Zealanders who married in 1983 had divorced before their silver wedding anniversary (25 years). Gee, I thought it might have been higher than that. Maybe a good number just stay separated. I may have recounted this before but it springs to mind right now. My young daughter had a friend over. She was a talkative, curious child. On espying a wedding photograph of David and I she turned to my daughter and asked, "Is that your Daddy? ", which Sam confirmed. It was the next question that floored me. "Where does he live?" I have been playing with some of the regional benefit data released for March 2009. These figures show the total number of people on main benefits and the percentage change (they are all positive) over the year. 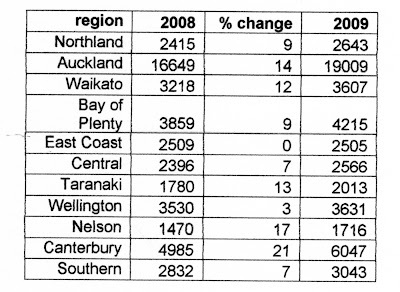 Obviously the highest growth is occurring in the cities, most noticeably, Auckland. Then I have broken down each main benefit. 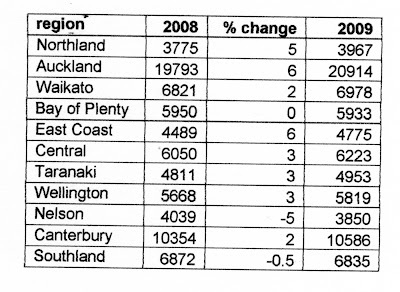 The highest percentage unemployment growth is Canterbury with Auckland second, but on a much larger base number. 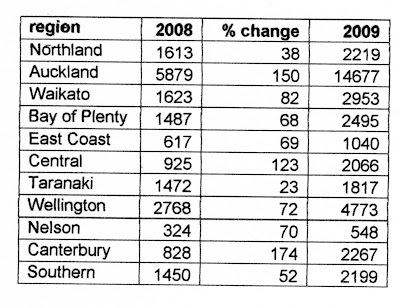 Again the highest growth is Auckland. More bad news because the highest percentage growth is also where the largest numbers reside. 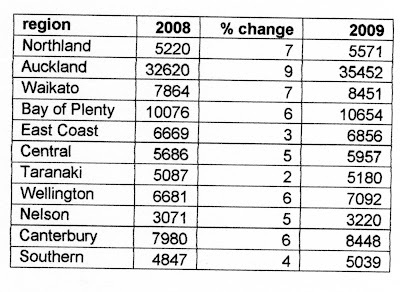 In conclusion most of the benefit growth is happening in Auckland. And it's not simply because that's where most of the population lives. 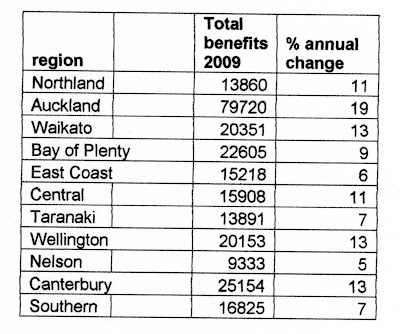 Almost half - 46 percent - of the extra numbers on welfare over the year to March 2009 live in Auckland. Although, to be fair, it is still proportionately under-represented in terms of general welfare dependence. "One in five New Zealanders has some form of disability, and that number is expected to grow by 60 per cent over the next 40 years." That means one in five is going to become one in three. Apart from the ageing population, why? What the hell is going on here? Why does government talk up disability? It seems almost to relish the prospect of growing dependence. I blame the infiltration of mothers (or potential mothers) into wider society, especially via the public service. It is one thing to mollycoddle one's own. To some extent that is the very essence of a mother. I do it with my own kids but that's where it ends. I really can't stand this disability-isation of people. So many invisible and invented maladies are now 'disabilities'. That means more funding, more planning, more nappy-changing. And it does a disservice to those with genuine and debilitating conditions. Proud people who struggle to maintain as much independence and self-reliance as they can. They are demeaned by all the me-tooers; the snouters wearing their newly described 'disabilities' like badges of honour demanding that government fawn all over them. People fighting to be more disabled than the next. And those that would indulge them. One in three people will have some form of disability? What a pathetic prediction and pathetic acquiescence. No. Not of the 'musical' kind. Rather,the banging-it-against-a-brick-wall variety. I think I am possibly not shouting loud enough or what is important to me is trivial and boring to others. Or a combination of both. But I will restate some news from earlier in the week. 6,000 more people are on the DPB than one year ago. That's around 10,000 children - enough to fill twenty five substantial schools. An annual six percent rise hasn't been seen since the early 90s. There are 37,000 unemployed people but over 100,000 on the DPB, where they will remain, on average, far longer than those on the dole. But the media thinks the demise of Wheel Of Fortune is more important. What's happening here is politics. Labour won't make a noise about it because they squandered the best opportunity to do something about the DPB any government has had. And National won't make a noise about it because they aren't prepared to do anything about it. Have we given up caring? Is the DPB just part of the wallpaper now? Is it so institutionalised there is no going back? Or rather, going forward? Good news. A new MP, Kanwal Bakshi has a property that was being operated as a brothel. That's what we need. More property-owning MPs.